MIX while you Meow…and Wolf if you want to! 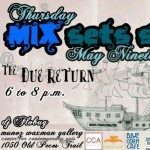 MIX brings it to Meow Wolf’s mighty installation–The Due Return–at Santa Fe’s legendary CCA this month. MIX will be launching the beta version of its brand-new, made-for-your-project-oriented, entrepreneur-pointed website. DJ Flobug will be in the command center delivering auditory orders to all decks. Blue Corn Brewery will merge its southside and downtown locations to provide suds and grubs for this month’s Meow MIXers. In addition to the ambrosiac substance commonly called beer, the BCB will be offering special introductions to its famed Brew Club for alchemy aficionados. The Underground will be on hand to facilitate mixed drinks, straight indulgences, crooked beverages and liquid desires for anyone and everyone with proper ID and a safe ride home. Commando tags legitimate for gratis adult beverages will be issued in exchange for proposing your best ideas to support starving artists and starving non-profits. Meow Wolf is a hyper-collaborative, next generation, innovation experiment–this is no mere art show we’ll be MIXing in and upon–they’ve merged a group of artists, designers, entrepreneurs, performers, luddites, technologists and inventors to create an environment that combines arts, mobile app technology, project management, public/private partnerships, and everything else you can think of, to create a free-wheeling, free-thinking space designed to encourage thinking about what’s possible when you put your mind to it and tap into community resources. Download the iPhone Elixer App by Tyler White that allows you to interact with the Meow Wolf show here: http://bit.ly/lZTc8u …cause you’ll be wanting it bad once you’re there. CCA is Santa Fe’s original, artist-run, multi-platform, creative space: a creature continually reinventing itself to serve the community’s appetite for culture, film, dialogue, venue and holistic representation. PS: This is a private party and is not open to the general public, but YOU are invited! And you can bring your friends and associates because, well, it’s MIX! Many thanks to the New Mexico Tech Council, Santa Fe Complex, Blue Corn Brewery, The Underground, CCA, Meow Wolf, the Santa Fe Reporter, SantaFe.Com and, as usual–and most importantly–everyone who shows up to MIX it up!